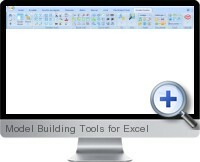 Model Building Tools for Excel also help to organize and document Excel models and favorite routines or templates. Model Building Tools for Excel have been developed to help people make decisions, from simple problems to multimillion projects with two ideas in mind: working faster and more reliably, i.e. making trustworthy decisions in time. Model Building Tools for Excel has a comprehensive set of tools to develop, analyze, audit and maintain models.